Click here to see a wealth of articles by Mr. Winitz. 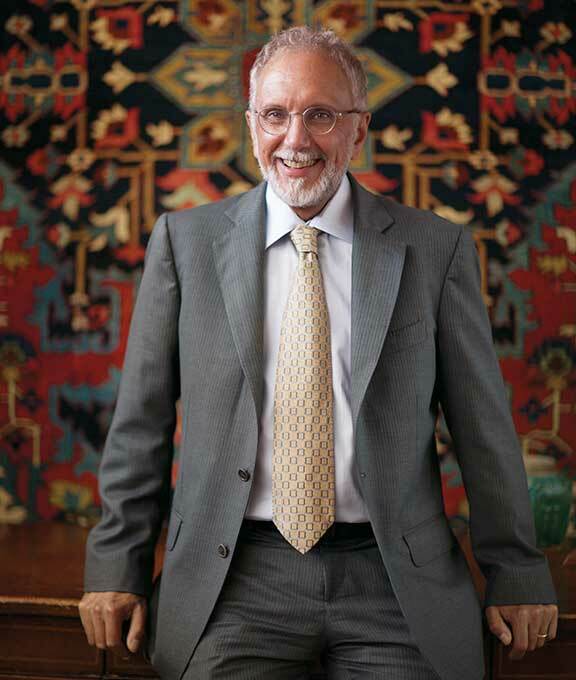 Jan David Winitz is president/founder of Claremont Rug Company, a California-based art dealer that specializes in high-decorative to museum-caliber 19th century Oriental rugs. He is the author of The Guide to Purchasing an Oriental Rug. In the collecting world, he is acknowledged as having elevated the status of rugs from the “Second Golden Age of Persian Weaving” (ca 1800 to ca 1910) from a decorative craft to an art form whose impact and value is on a level with the finest and most sought after paintings, sculpture and antique furniture. Inspired by a family member’s collection of Near Eastern rugs, he acquired his first antique carpet at age 16. Later, during the three years that he spent as a high-school English teacher, he sold rugs privately. Then, in 1980 at the age of 25, he left teaching to found Claremont Rug Company in a small storefront building in Oakland with his wife Christine Hunt Winitz. With the goal of presenting antique carpets to the public as, “works of art comparable to those usually displayed on the wall,” he chose to build his business around an educational model with the client service as its basis. Dubbed “Client First,” Winitz has written and been published extensively on the subject (articles about the topic can be found below). Winitz has been credited with raising the critical opinion about antique Oriental carpets from that of a craft to a collectible art form, investment and tangible asset. Among his clients are Silicon Valley entrepreneurs, entertainment industry and international business executives, rock music stars and classical musicians, Nobel Prize winners. His clients, who reside on five continents, also include over 75 Forbes 400 List billionaires. In 2009, The Robb Report named Winitz and his gallery as the “Best of the Best,” in its Antiques category. It was the first and only time that a rug purveyor has been selected for the accolade. Over the years, Claremont and Winitz have contributed articles and has been written about by publications ranging from Art Daily and Arts & Antiques magazine to Robb Report, the Financial Times of London, the New York Times and the Wall Street Journal. He has also been a regular contributor to publications produced by AXA and Chubb insurance companies. Such is his reputation and standing in the art world that when an antique Oriental rug sold for a record $33.7 million at an auction in 2013, he was widely quoted about the significance of the price. His “Client First” business philosophy where customer service begins at the first interaction with a potential client has been published in Wealth Management, Money Inc. and Luxury Daily, all publications designed to highlight innovative thinking and best practices to businesses who work with wealthy individuals and families. “I firmly believe that providing education, valuing integrity, being tremendously responsive to our customer’s needs and having deep expertise are the core attributes that have built trust and allowed us to maintain relationships with many clients for decades,” he says. Claremont Rug Company Founder Jan David Winitz Reveals Major Shifts in High-End Antique Oriental Rug Market – New! In this article on artdaily.com, Claremont Rug Company Founder & President, Jan David Winitz reveals major shifts in the high-end antique Oriental rug market. 2018 Year-End Review & Prospective on 2019 – New! In his annual year-end overview, Jan David Winitz discusses how Claremont Rug Company’s impassioned clientele, exceptional rugs and seamless technology create great vibrancy in high-end antique rug market. In this feature article in Luxury Daily Magazine, Claremont Rug Company’s Jan David Winitz discusses why customer efficiency is not customer service. In this feature article in Luxury Daily Magazine, Claremont Rug Company’s Jan David Winitz discusses building lasting relationships with clients. In this article for Money Inc., Claremont’s Jan David Winitz discusses how he has successfully built and sustained client relationships for nearly four decades. In this article, Claremont Rug Company’s Jan David Winitz explains what to look for when purchasing Persian antique rugs and Caucasian tribal rugs. Part 1 of a 4 part write-up in Carpet Collector Magazine that takes an in-depth look at the symbolism of motifs found in 19th century Caucasian rugs. Part 2 of a 4 part write-up in Carpet Collector Magazine that takes an in-depth look at the symbolism of motifs found in 19th century Caucasian rugs. Part 3 of a 4 part write-up in Carpet Collector Magazine that takes an in-depth look at the symbolism of motifs found in 19th century Caucasian rugs. Part 4 of a 4 part write-up in Carpet Collector Magazine that takes an in-depth look at the symbolism of motifs found in 19th century Caucasian rugs. This is the first of a two part interview with Claremont Rug Company’s President, Jan David Winitz, about antique Oriental rugs & antique Persian carpets. This is the second in a series of interviews with Claremont Rug Company’s President, Jan David Winitz, about antique Oriental rugs and Persian carpets.